Sorry for not adding this walkthrough earlier, had it done, but honestly thought it was not necessary, there are a few other web sites that have it done already. But apparently I was wrong. This is why it's wrong to assume. Lesson learned. (2.) Brush his hand away. (1.) what do you mean worried? (2.) I'm a bit nervous. (3.) We have to prepare. (3.) You don’t want to do something else? (1.) I have to hear it from him. (3.) I want to touch you too. (2.) Would I be a nuisance? (3.) 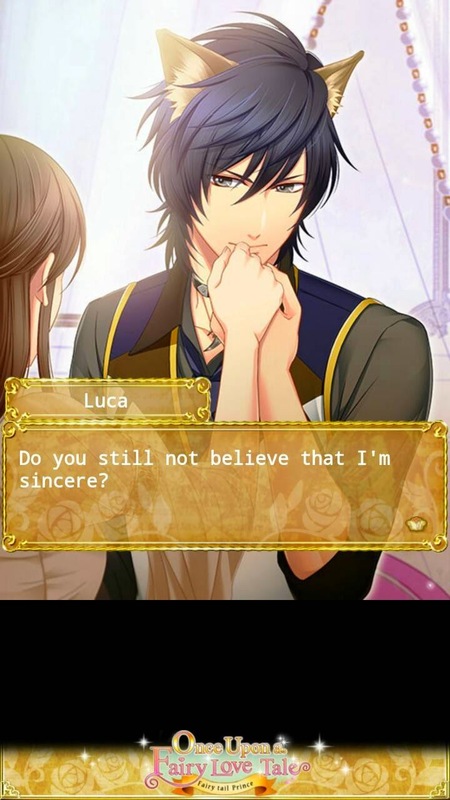 If Luca wants to, then okay. (1.) I want to know now. (2.) Are you trying to evade the question? (1.) I don't understand what you mean. (2.) I didn't think of that. (1.) I'm worried about my memories. (2.) I'm worried about the Red Kingdom. (3.) I want him to accompany me. (2.) Because I want to do what I can. (3.) Because I don't know what kind there are. (1.) We're not done talking. (2.) Am I a bother? (1.) Please come with me! (2.) Please watch my back. (1.) It wouldn't be good. (3.) You should take everyone's advice. (2.) There's nothing else I could do. (3.) I'm a bit worried, but I'm okay. (1.) I won’t leave you even if I die. (2.) Don't ask me something you know the answer to. (1.) That may be true. (2.) Even magic can hurt. Remember Use Gacha points! In order to reach affection points! Honestly I Ended Up Purchasing Affection Points.